Brain has been eaten by re-release of a side project. For anyone here due to Raspberry Pi hacking or whatever, my previous hobby of computer game modding accidentally turned into a job. Anyway, for various reasons, I've got round to re-releasing my oft-downloaded Half-Life 2 mod. On Valve's mighty, world-spanning Steam. Yay! MINERVA on Steam - or if you'd rather, the super-cryptic official site. Things will be back to normal next week, once my brain has accumulated sufficient new links for linking. Wasn't there a Minerva follow up on the work ? Unfortunately, you managed to time the release with a bank holiday in the UK, with ACTUAL SUN! So it'll be a few days before I get round to replaying it. Ok, I'm mainly being smug. Please make Minerva: Out of Time. I just played through it again for the first time in quite awhile. Still outstanding, no sign of aging. I obviously always enjoyed the cryptic storyline, and the great 'sense of place' it gives. I went back over the story tidbits on the website and in both mods and around and I think I can more or less piece things together, given all our accumulated info. Still some questions though; what really happened to Ms. Hauschild after being zipped off to that mirror/triplet/whatever universe? Who are/were her 'adopted forefathers'? Do the combine now know about them? What next??? Clearly we need a followup of some sort?! I didn't see any Minerva-related stuff in Portal 2, perhaps in your current activities? 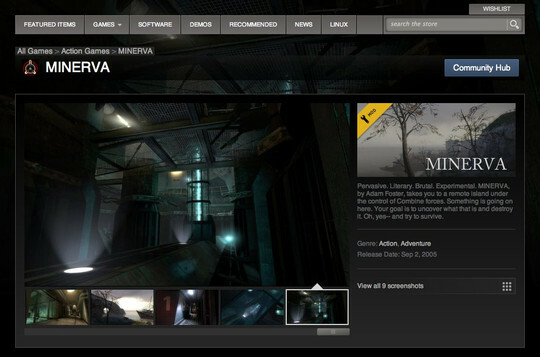 I hope that is something half-life/Portal/?Minerva? related? Ah well, had to ask. WHAT IS HERE IS DANGEROUS AND REPULSIVE TO US. THIS MESSAGE IS A WARNING ABOUT DANGER. THIS PLACE IS NOT A PLACE OF HONOR - NO HIGHLY ESTEEMED DEED IS COMMEMORATED HERE.